Abstract: Person following behavior is an important task for social robots. To enable robots to follow a person, we have to track the target in real-time without critical failures. There are many situations where the robot will potentially loose tracking in a dynamic environment, e.g., occlusion, illumination, pose-changes, etc. Often, people use a complex tracking algorithm to improve robustness. However, the trade-off is that their approaches may not able to run in real-time on mobile robots. In this paper, we present Selected Online Ada-Boosting technique, a modified Online Ada-Boosting (OAB) tracking algorithm with integrated scene depth information obtained from a stereo camera which runs in real-time on a mobile robot. We build and share our results on the performance of our technique on a new stereo dataset for the task of person following. The dataset covers different challenging situations like squatting, partial and complete occlusion of the target being tracked, people wearing similar clothes, appearance changes, walking facing the front and back side of the person to the robot, and normal walking. **The code for the project is available for sale. Please contact me ( raghavendersahdev@gmail.com ) for more details! 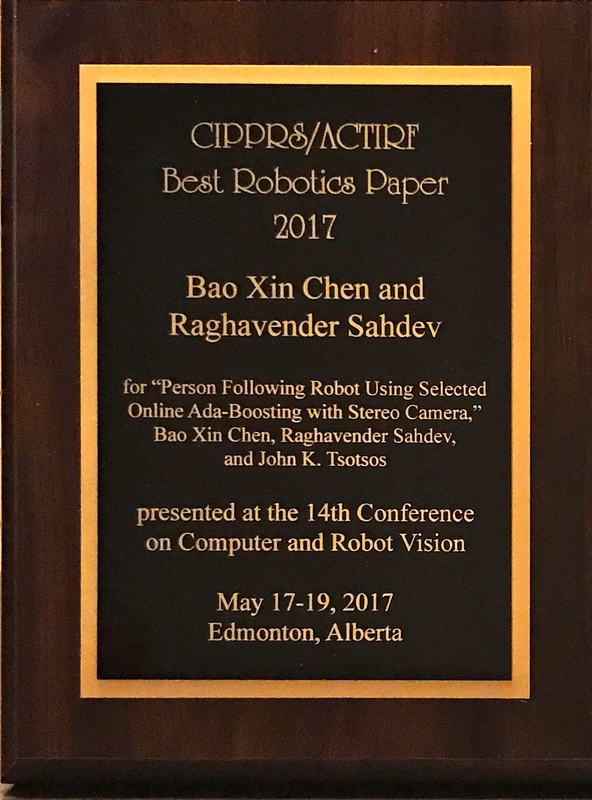 Person Following Robot Using Selected Online Ada-Boosting with a Stereo Camera, By Bao Xin Chen, Raghavender Sahdev and John K. Tsotsos, In the 14th Conference on Computer and Robot Vision, Edmonton, Alberta, May 16-19, 2017. We won the Best Robotics Paper Award at AI-GI-CRV conference. 14th Conference on Computer and Robot Vision, Edmonton, May 17-19, 2017. The robot follows the correct person even when another person wearing the same clothes occludes the target being tracked. It also shows appearance changes - the target removes his jacket first and after some time wears the jacket. The robot follows the correct target all the time. The robot follows the person in a university hallway. The target is occluded by another person, shows picking up a bag and later removing the bag and continues to walk. The robot follows a person in a university hallway, the target picks up a bag then removes it and finally is seen to be duck walking.